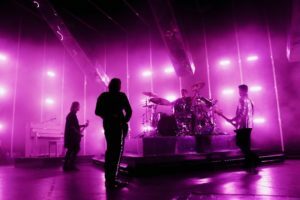 5 Seconds of Summer closed their North American leg of their Meet You There tour at The Greek Theatre in Los Angeles, CA. Despite the far from ideal weather, the outdoor venue was completely sold out thanks to their devoted fans! 5SOS has been making waves in the music industry since they debuted their single She Looks So Perfect in 2014. Their style has progressed from the pop-punk roots that formed their fan base to a genre-bending rock band. The Meet You There tour featured their newest album Youngblood which debuted at #1 on iTunes in over 18 countries, has secured a spot as the top song on US radio, and a top ten placement on Billboard’s Hot 100. One aspect of the band that has remained constant throughout their evolution and lulls in music-making are their fans. 5SOS fans are quite admirable, over 5,800 people withstood the rain and wind chills with unwavering optimism. The Greek Theatre seemed as if it were separate from the rest of Los Angeles. That night it served as an oasis for fans to sway in the rain to the softer choruses of Lie to Me and Amnesia and rock out to the faster beats of Babylon and She’s Kinda Hot. Starting October 23rd, 5SOS will be taking their Meet You There tour to Europe. For more photos be sure to check out our Instagram.